Official booking for our next production THE PRODUCERS is now open. Book via the theatre Box Office, online with The Core Theatre, ring the Ticket Secretary or email your booking request direct to us. 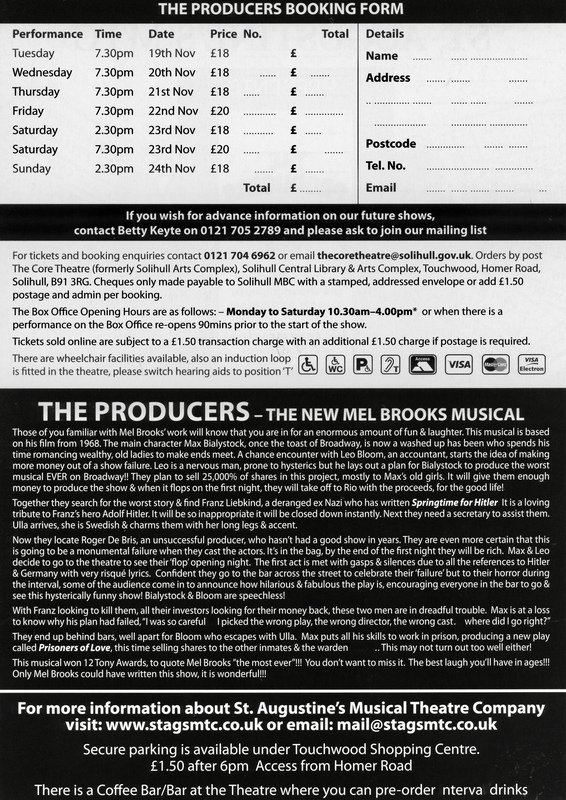 Performance dates/times, ticket prices and all the relevant contact details are listed below. 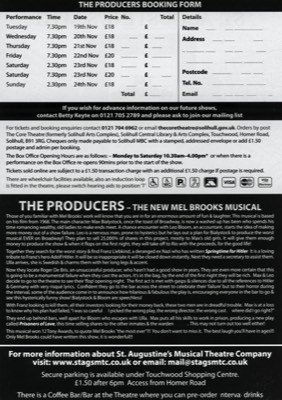 Theatre Box Office: 0121 704 6962 - open Monday to Saturday from 9.30am (10.00am on Wednesdays) to 3.00pm. However, when there is a performance on at The Core Theatre, the Box Office re-opens 90 minutes before the start of the show. To book online: visit our link on the The Core Theatre website. Email: You can email your booking order direct to us at mail@stagsmtc.co.uk - please include your telephone number. You can also email The Core Theatre with your booking. 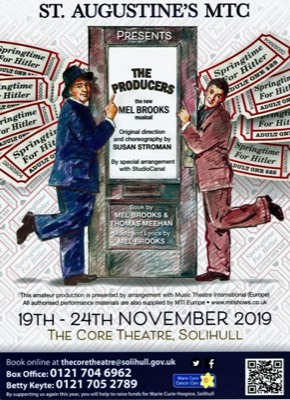 Ticket orders can be placed by post by sending your names, address, telephone numbers and ticket request to: The Core Theatre Solihull, Theatre Square, Touchwood, Homer Road, Solihull, B91 3RG. Cheques should be made payable to Solihull MBC. Please write you name, address and cheque guarantee card number on the reverse of the cheque. Enclose a SAE for your tickets to be sent to you or add £1.50 to your cheque for administration charges. Tickets sold online are subject to a £1.50 transaction charge, with an additional £1.50 charge if postage is required. There are wheelchair facilities in Row A; the box office needs to be notified of wheelchair requirements at the time of booking. Front row seats cannot be booked online - please telephone the Box Office. An induction loop is fitted in the theatre - please switch hearing aids to position T during the performance.